Located in southwest Arkansas at the edge of Hot Springs National Park, Magic Springs & Crystal Falls offers a great spot for families and friends to visit from all neighboring states. Measuring almost 200 acres, this attraction is rated as one of the top ten theme parks in Arkansas on TripAdvisor. Which Day of the Week Is Best to Go to Magic Kingdom? X-Coaster is a thrill ride for adrenaline junkies. This coaster is unique in that it starts you off upside down at 150 feet in the air for a moment, then runs you through 360 corkscrew rolls followed by a loop, then goes back through the loop in reverse. It will definitely get your pulse racing! This ride has a 52" height minimum. The Big Bad John Coaster is the longest coaster in the park at 3,500 feet in length. The ride got its name from a runaway mine train and John Henry, a 19th century American folklore hero. There is a 42" height minimum to ride. Sky Shark is described as a mix of skydiving, bungee jumping, and hang gliding. You are hoisted 115 feet into the air on a steel arch. Once the cord and is pulled, you'll free-fall at speeds up to 50 mph. Don't worry - your harness will comfortably hold you secure. The Gauntlet is a 2,200 feet long suspended steel roller coaster reaching speeds of up to 50 mph. With a 110 foot drop, this coaster offers lots of excitement. High Sierra Slide Tower (thrill) consists of four waterslides, each with its own exhilarating twists and turns. Visitors must be 48" to ride. Old #2 Logging Company Log Flume (family) is a great family ride, which will result in everyone getting a little wet. Visitors from 36" - 42" are required to be supervised by an adult. Crystal Falls Wave Pool (family) is a 35,000 gallon wave pool offering fun and refreshment for everyone. Boogie Blast (thrill) creates the experience of surfing a wave. Visitors must be 42" to experience this ride. There are a number of kid-friendly water attractions ideal for younger visitors and disabled guests, such as Krystal Lagoon Pool, Grizzly Creek Family Splash Zone, and the Bubble Up Pool. Of course, parents still need to supervise young children. To elevate your water park experience, consider renting a VIP Cabana for the day. Every year the park puts together a great season of concerts and special events hosted at its Timberwood Amphitheatre. Concerts hosted by the park are announced on Park's concert page, giving the time, date and artist for each performance. Bacon Day: This is a celebration of everything bacon. Look for unique baked items, cooking demonstrations, and lots of interesting food samples. There is even a bacon eating contest if you want to join in on the fun! Memorial Day: Celebrations include a parade inviting ROTC programs, school marching bands, and floats. There is also a classic car and truck show. Magic Sweets, which serves fudge, candy, cookies and iced coffee. Goodie Gallery, which features theme park favorites like hot dogs and soft serve ice cream. Split Rock Grill, which showcases tasty sirloin burgers, chicken strips and corn dogs. Smoke on the Water, which offers delicious slow smoked barbecue, pulled pork, brisket quartered chickens and homemade sides. Alcohol is served in the park, but those who appear intoxicated will not be allowed on the rides. The regular price for a single person admission at the gate is $59.99 plus tax on Saturdays, and $44.99 plus tax Sunday through Friday for guests over 48" in height. Children 3 years of age and younger receive free admission. Children shorter than 48" in height and seniors are admitted for $34.99 + tax Sundays through Fridays and $36.99 + tax on Saturdays. This includes all areas of the park, except for prize winning games or additional up-charge attractions. You can purchase a season pass for $64.99, which includes unlimited entrance into the theme and water park, monthly discount coupons, as well as admission to specialty events and summer concerts. This is a great deal if you intend to visit more than once a year. The park offers a $5 discount if you purchase your general admission ticket online. There are other sites where you can sometimes purchase discounted tickets, such as retailmenot.com. Follow these helpful tips to make your most of your park experience. One Yelp reviewer noted that it would a mistake not to take advantage of the water park. Another Yelp reviewer noted that you can easily spend two days in the park, one in the theme park and one in the water park. Parking is $10.00, and includes same day "in and out" privileges, provided you show your receipt for the day. There is a dress code in effect at the park. Attire needs to be modest and not too revealing. Proper swimwear is required for the water park. You can wear a swimsuit in the theme park, but you must have shorts and shirt over top for your own safety. No outside food or drinks are allowed inside the park. Get to the park early so you can avoid the long lines and get into rides quicker or claim lounge chairs first. Get a locker so you don't have to keep an eye on your belongings every second. Set up a meeting place so you and friends or family can regroup if you get separated. 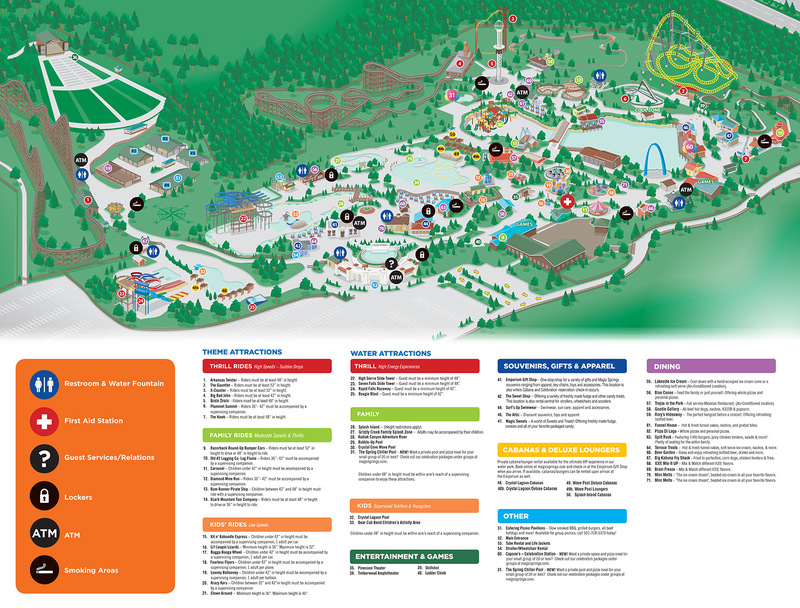 Get to know the park ahead of time and identify the things you would want to do using the park map. Lookout Point Inn offers two packages, one for four nights and the other for seven nights. Both packages include admission to Magic Springs & Crystal Falls, along with many other area activities. Knight's Inn is another Magic Springs® partner hotel. The pet-friendly spot offers affordable accommodations within less than a mile from the park. There is a KOA Campgound only minutes from the park where you can enjoy tent and RV camping or rent cabin. You can fish at the campground, as well as enjoy its swimming pool and miniature golf course. 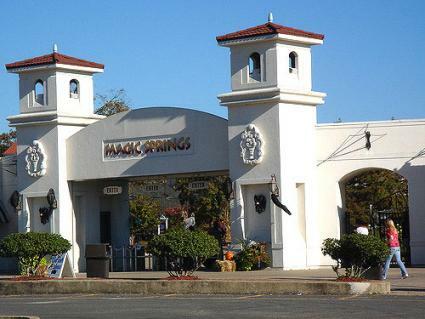 Hop on their guest shuttle for a free ride to Magic Springs & Crystal Falls, as well as to other nearby attractions and activities. There is more to do in Hot Springs than just enjoying your time at Magic Springs & Crystal Falls. Take in all the region has to offer while you are in town! Be sure to visit Hot Springs National Park, the oldest of America's national parks. It features hiking trails, beautiful mountain views, and 47 thermal springs. The quartz crystal deposits are another big attraction in this area, which is regarded as having the one of the highest quality quartz crystal. There are even areas where you can mine your own quartz crystal. This part of Arkansas is also very well known for its horse racing. Every year, the Oaklawn Racing and Gaming hosts racing events from January through April. If you have a great time here, consider planning a future trip to one of the other awesome theme parks in Arkansas! The park is typically open from 11:00 a.m. to 7 p.m. on the weekends in spring, all week during the majority of the summer months and on the weekends again, winding down to its closure in November. Water park operating hours vary, typically opening in early May and closing down around Labor Day.